"elektronische Einspritzanlage - Go EFI 3x2 Tri Power"
FiTech's Go EFI 3x2 Tri Power 600 HP Fuel Injection Systems with External ECU sticks to basic functions that deliver the best possible performance and economy for your street and mild performance engine. 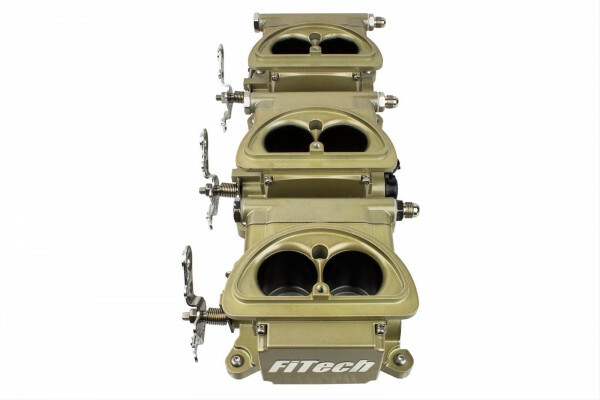 This FiTech ready-to-run throttle body system allows you to remove your carburetor and advance into the EFI world at an affordable price. The Tri-Power 600 HP System comes complete with a classic gold die-cast aluminum throttle body, hand-held controller, windshield mount, wideband O2 sensor, coolant temperature sensor and a compact external ECU.